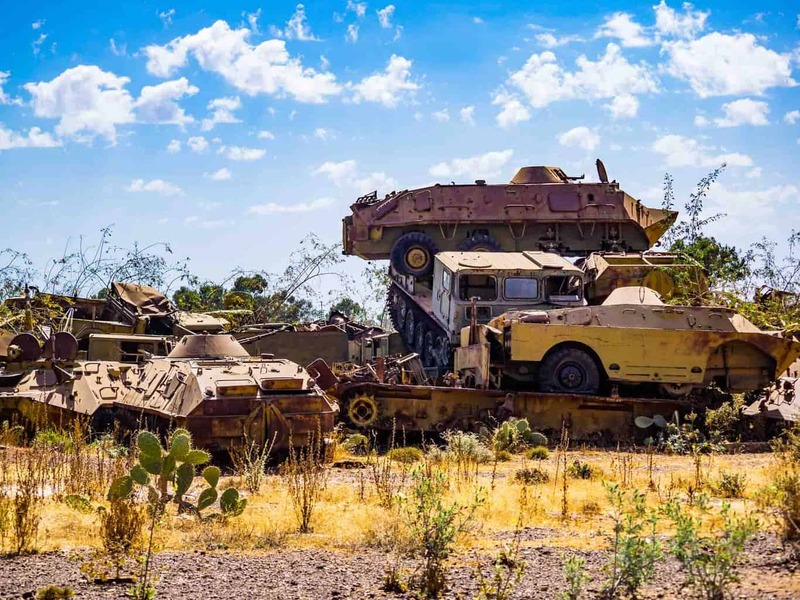 On the outskirts of Asmara, the capital of Eritrea, lays an infamous tourist site, the Military Tank Graveyard. 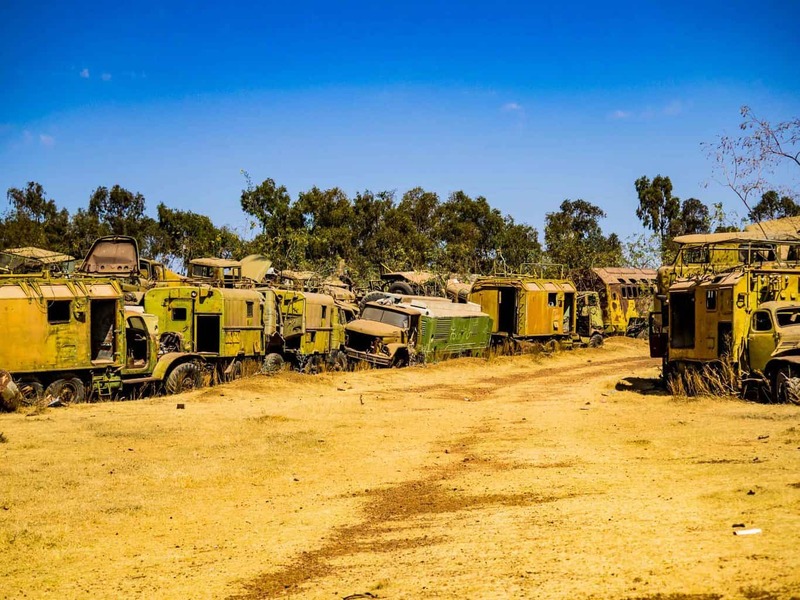 The place is covered with military vehicles used in the 30-year long war between Eritrea and Ethiopia. 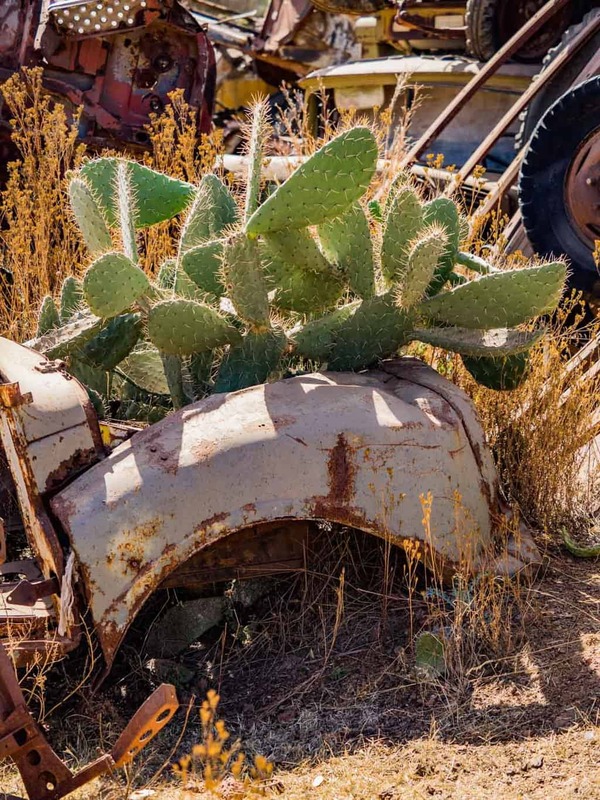 Maybe you are curious as to why keep old rusted up military equipment. It is to remind the people of Eritrea about the sacrifices that were made to free their nation. 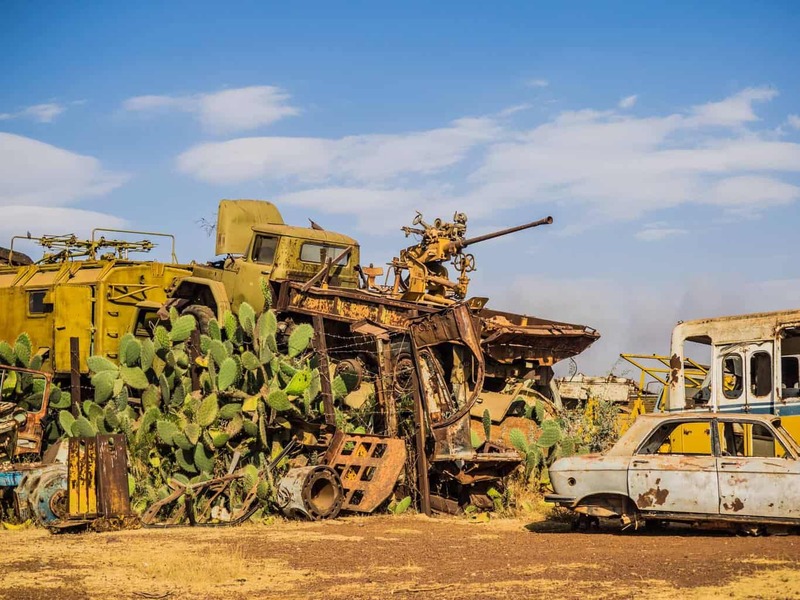 The place is covered with hundreds of military vehicles and wracked up normal cars vehicles stacked on top of each other. There’s even an airport flight stair car stacked up here. Kinda look cool though, with all the stuff stocked up here. Even a Flight Stair car is stocked up here. 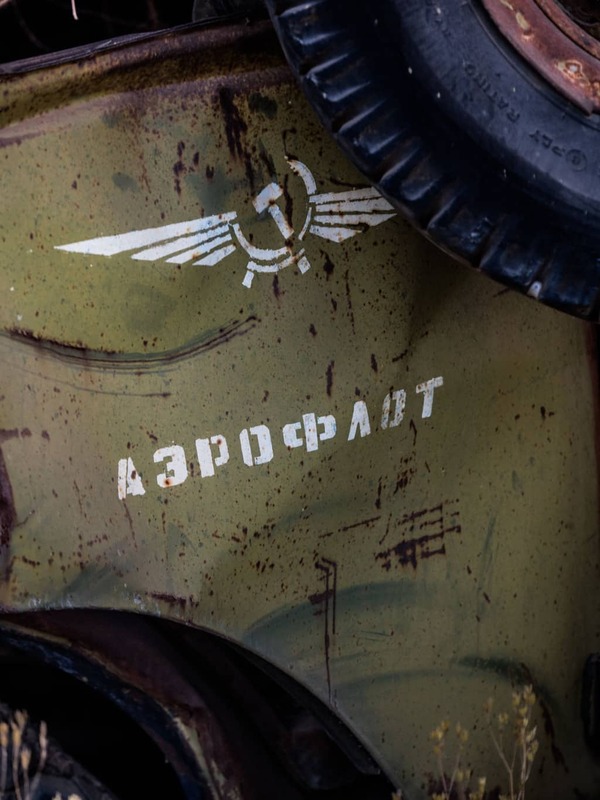 Some of the cars are from old Soviet. 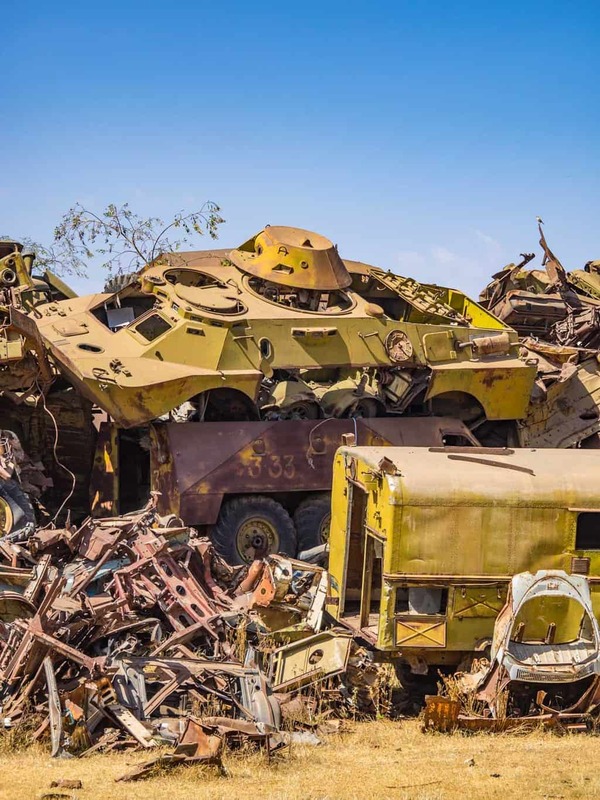 When travelling around Eritrea, you will come across a lot of rusted up military equipment along the roads. 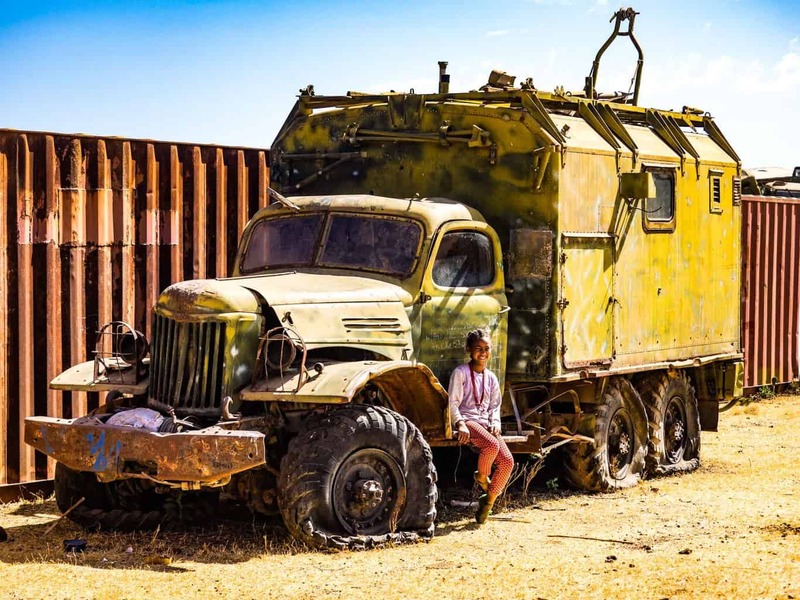 Don’t be surprised if you pass everything from military trucks laying upside down, to rusted up tanks that the local kids use as their playground. 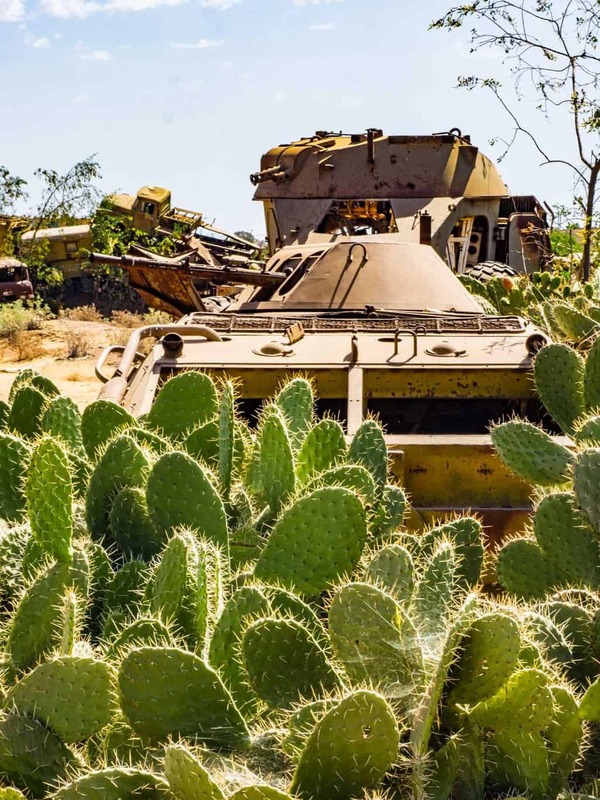 A Local kid hanging out in the tank graveyard. Nothing is like walking your goat´s through a park with old military gear. If you decide to walk to the Tank Graveyard then you will enjoy walking through one of the best neighbourhoods in the country. You will pass by the house of the Chinese and British Ambassador. 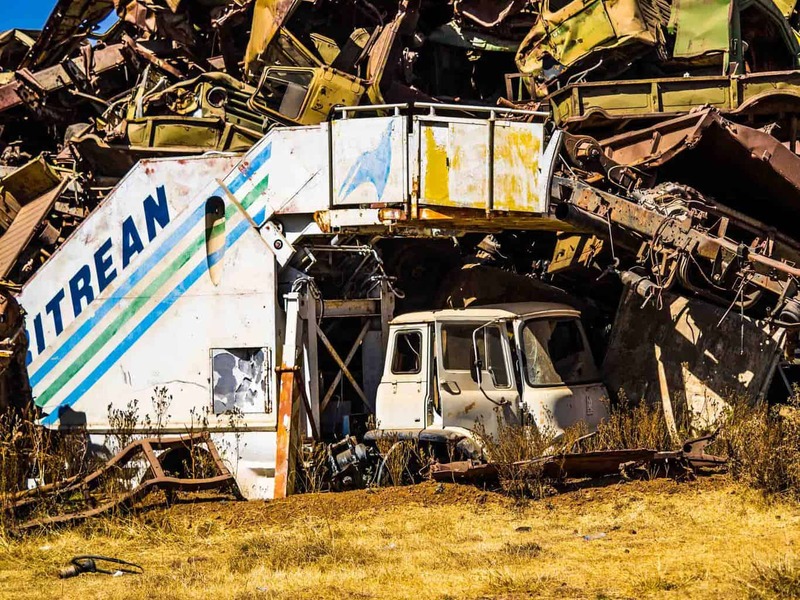 Once you pass the stunning neighbourhood, just across the road and your big bad junkyard is right there. Quite a contrast, haan? Like with everything else in Eritrea, you will need a permit to visit this site. The permit is FREE (remember to bring your passport). 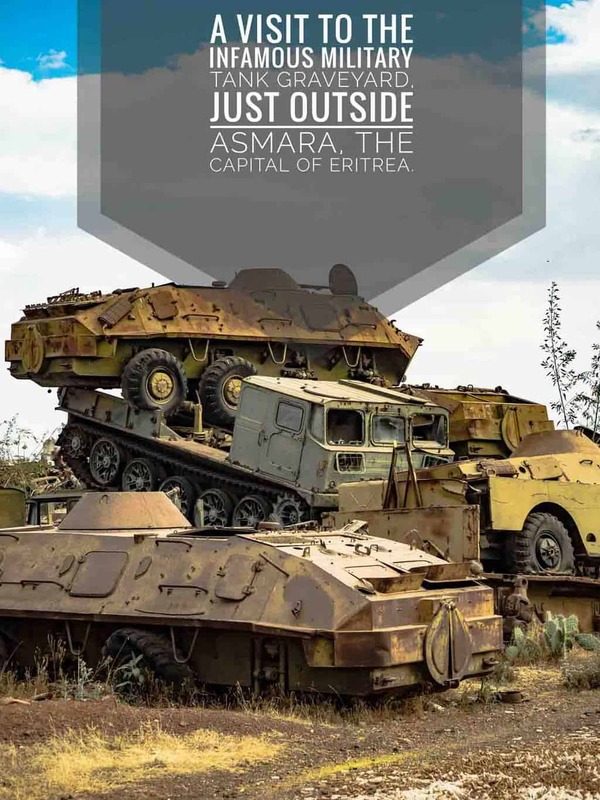 You will have to visit the Ministry of Tourism and Information across the big Cathedral in Asmara to get it. 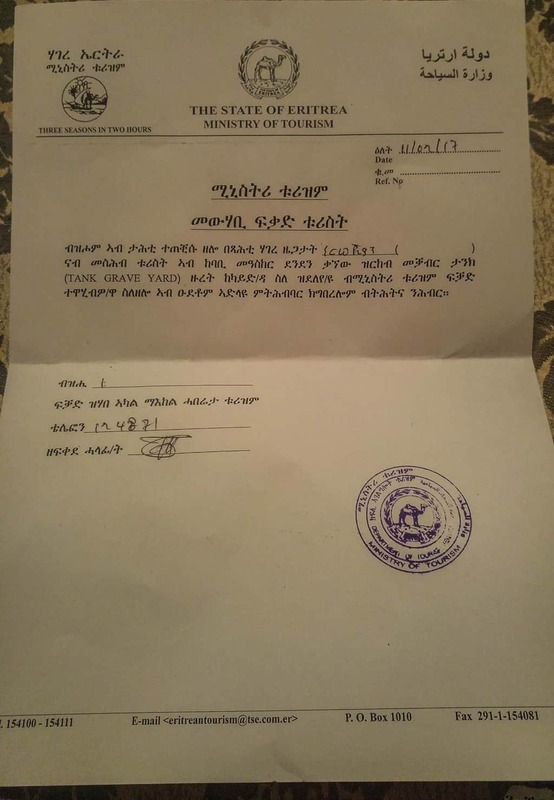 Before going to Eritrea, I contacted a few local travel agency about getting the permit to the Military Graveyard. Some of them wanted to charge me 50 USD to get it. And yes you will need your permit. There were few armed security guards walking around. And they will ask to see your permit. 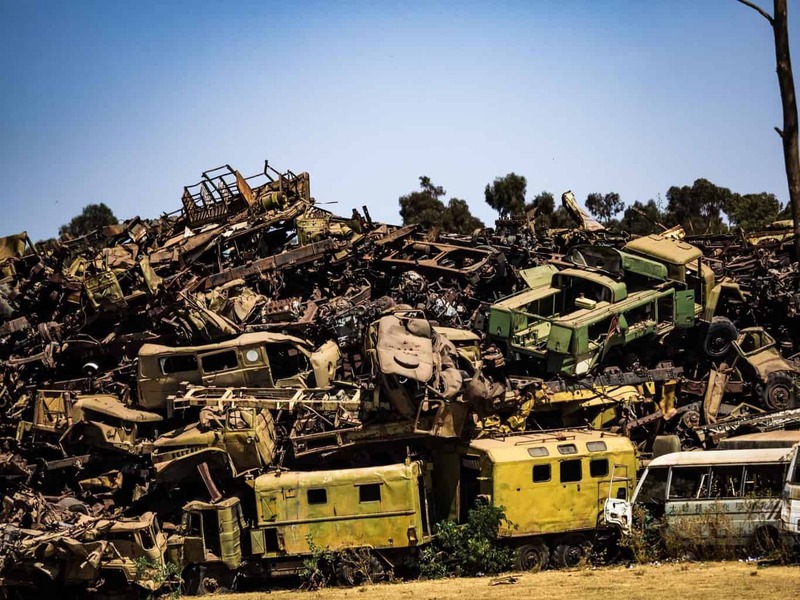 In any other country, this place would be a scrap metal merchant’s dream, but here in Eritrea, it remains as a symbol of pride and victory over Ethiopia. An old forgotten car with an anti-aircraft gun. Goat´s hanging out next to the Tanks. Fast information about the Eritrea -Ethiopia war. 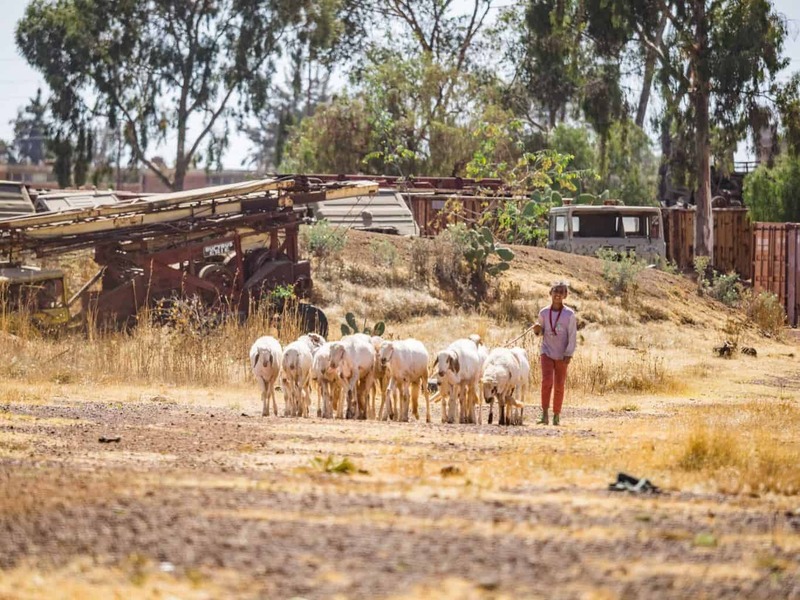 After Italy’s defeat in World War2, Eritrea struggled to keep itself afloat economically. So the United Nations decided in 1950 that it would be better off being Ethiopia’s 14th province. A thing Eritrea had spent the last 50 years to avoid. Eritrea became part of a federation headed by Ethiopia after WWII. Overtime, Eritrea’s independence diminished as Ethiopia increased its influence and power. 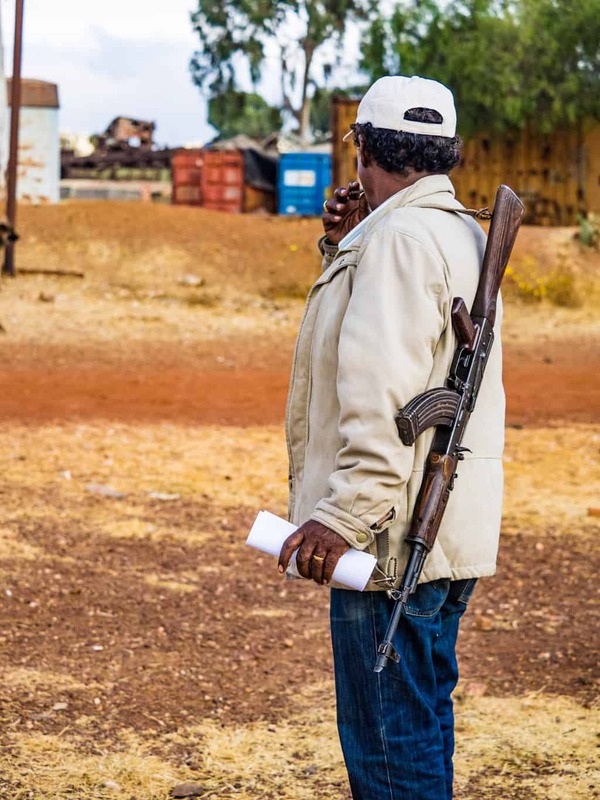 Starting in 1961, a fight for independence began, as Eritrea struggled for its freedom. 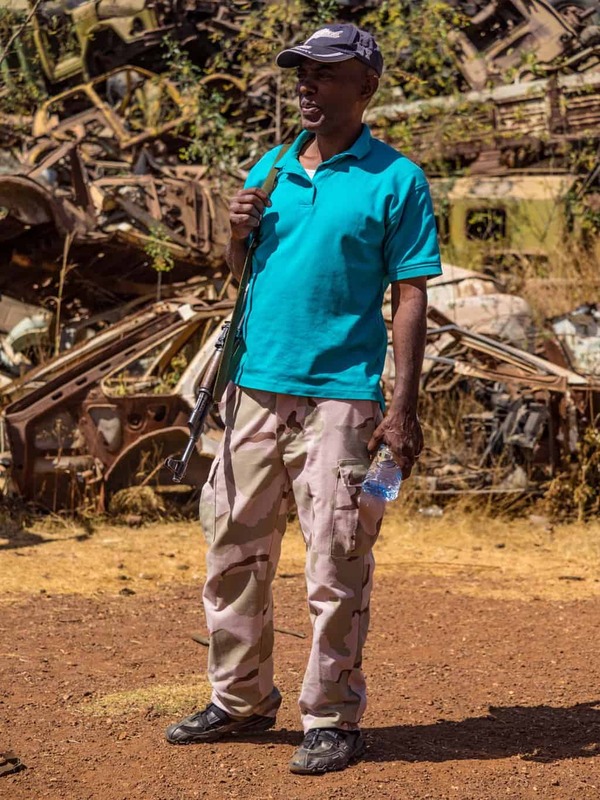 In 1991 in Ethiopia, the Marxist Derg government was overthrown by rebel parties. 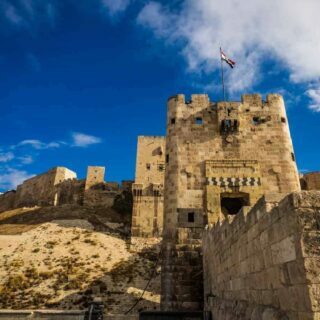 And this coincided with military victories over the deflated Ethiopian forces by the Eritreans. In a referendum in 1991, Eritreans voted overwhelmingly for their independence. Eritrea had become part of Ethiopia after World War II when both territories were liberated from Italian occupation. Ethiopia claimed that Eritrea was part of their country. Ethiopia’s wishes were fulfilled after the United Nations General Assembly federated Eritrea to Ethiopia as a province as early as 1950.
tank or cactus?Following the Marxist–Leninist coup in Ethiopia in 1974 which toppled its ancient monarchy, the Ethiopians enjoyed Soviet support until the end of the 1980s, when glasnost and perestroika started to affect Moscow’s foreign policies, resulting in a withdrawal of help. This is the longest war fought in Africa in the 20th century. There were over 200,000 casualties. 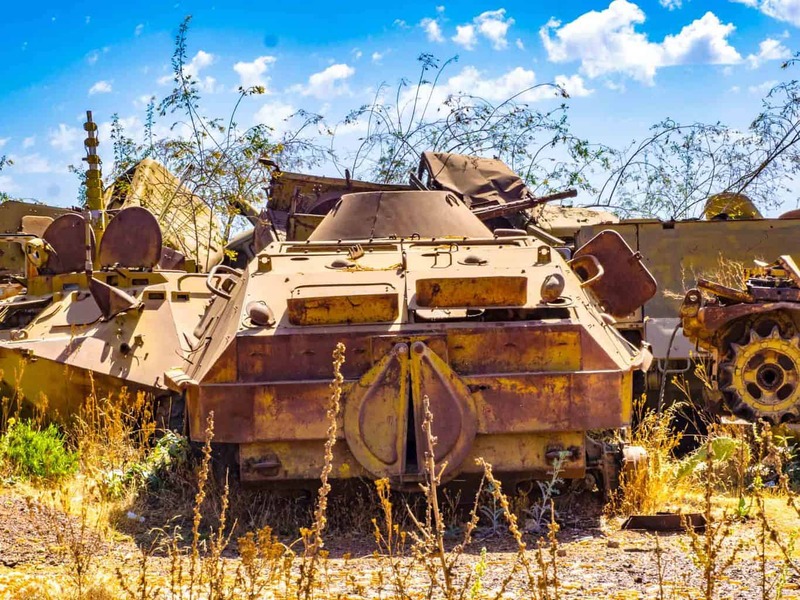 The war went on for 30 years until 1991, when the Eritrean People’s Liberation Front (EPLF) defeated the Ethiopian forces in Eritrea.